One of the longest-established galleries in the area, specialising in 20th-century, traditional and semi-abstract work by mainly British artists, such as Fred Cuming RA and Len Tabner, plus a brokerage service for higher-value paintings-Fedden, Munnings as an alternative to selling at auction. Founded in 1980 by Brian Sinfield, Don Steyn and Gerard O’Farrell, the gallery began by selling Victorian watercolours before establishing its reputation for representing leading Modern British artists. The owner, Sharon Wheaton, has collaborated with the Royal Academy in showing the work of RAs in a rural setting. Based from 2007 in an old milk-pasteur-isation plant, this well-established gallery sells 19th- and 20th-century British and European paintings from Laura Knight to Ivon Hitchens, Kurt Jackson and Graham Sutherland. Sells contemporary British art and crafts by established artists such as James Dodds and ceramicist John Maltby, as well as emerging talent. Situated in a 16th-century house, Art 18/21 works with other galleries from around the country and abroad, especially India, to show established and emerging talent in Norwich’s medieval quarter. Run by second-hand bookshop owner turned art dealer Mike Gold-mark, the gallery sells an eclectic mix of prints, drawings, ceramics, paintings, collage and sculpture. Recent acquisitions include John Piper and Lucian Freud. It also makes films and publishes books. 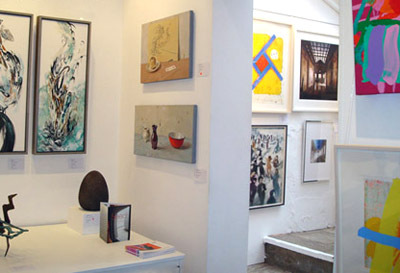 Set up in 2010 by a former director of Offer Waterman in London, this independent gallery in a beautifully converted old bookshop on a pretty village street shows very good, mostly English, paintings by a list of names that reads like a Who’s Who of 20th- and 21st-century artists. There’s also sculpture, ceramics, work with local resonance, weekly art courses and very good coffee. Formerly of Sotheby’s British Paintings Department, Josie Eastwood ran a contemporary art gallery in London before setting up in Hampshire nearly 20 years ago. Exhibitions are hung around her own home, a series of barn conversions, and in the grounds during spring. She can arrange portrait commissions by artists such as Oliver Akers Douglas, Hugo Grenville and Binny Mathews. Founded in 1973, the gallery specialises in contem-porary British fine art, sculpture (including outdoors), original prints and ceramics. Shows works by John Piper, Elisabeth Frink, Donald Hamilton Fraser and Mary Fedden and represents Julian Trevelyan’s estate. A well-known contemporary gallery that draws on Cornwall’s Modernist tradition, with a wide range of up-and-coming and established artists. Famous names include John Bellany, John Byrne, Alan Davie, Sandra Blow and John Hoyland. a potager and sculpture gardens. Sells a range of arts and crafts, from Breon O’Casey’s paintings and Denny Long’s etchings to ash and willow furniture by Guy Martin and jewellery by Guy Royle. In winter, the gallery is used as a workshop for residential courses. in Modern and post-Second World War painting and sculpture. ‘Eclectic Eye’ exhibitions include tribal art and objects from America and Asia. Has been dealing since the early 1990s in Modern British Art with particular emphasis on the post-Second World War period. Latest acquisitions include George Dannatt, Martin Bradley, Alan Davie, Clifford Fishwick and Henry Moore. Located near the abbey and medieval buildings of this delightful market town, the gallery exhibits British Contemporary painters and sculptors, much of it with a rural feel. Specialises in contemporary fine and applied arts. Run by Petronilla Silver, former director of the Contemporary Art Society in London and a respected expert on collecting, who can advise private individuals on their collections. in this east Devon fishing village stocks the works of about 100 local and national artists and craftspeople. The Old Kilmorack Church, by Beauly, Inverness-shire (01463 783230; www. lished in 1997 by Tony Davidson in a beautiful 18th-century church. Artists represented include Helen Denerley, Eugenia Vronskaya, Allan MacDonald, Michael Forbes, Lotte Glob and the late Gerald Laing and George Wyllie. Operating since 1997, the gallery has promoted the work of artists such as Alan Davie, Adrian Wiszniewski, Norman Adams and Wilhelmina Barns-Graham and recommends watching out for such up-and-coming names as Yukako Sakakura, Christopher Freitag, Sheena Tyrer and Myles Linley. It also stocks individual works by many celebrated 20th-century British artists. The business was established in 1972. Subject matter to be found in its large stock reserves includes landscape, marine, sporting and still-life; Parisian street scenes and the Belle Epoque are specialities. Friendly family business started in 1982 by brothers Mark and Glenn Rowles-now joined by Glenn’s daughter Frankie. It’s got everything from Victorian (such as Edgar Hunt and Louis Bosworth Hurt) to 20th-century (Lionel Edwards and Sir Kyffin Williams) and Contemporary (Anthony Gibbs and Terence Lambert) art, plus sculpture (David Williams Ellis and Joseph Paxton). The galleries also offer valuations and restoration. in Menai Bridge, Angelsey (01248 715128). Established in 1979, the gallery sells works from 1900 onwards. Recent acquisitions include works by Elisabeth Frink, Andy Warhol, Barbara Hepworth and Ernest Bawden.